Daily Production Report - smart & almost automatic - saves you hours! Daily Production Reports – almost automagically! How would you like to save 2-3 working hours a day on set? With Dramatify’s new Daily Production Report you can! While making sure your team don’t forget to report any important information, releases or incidents. Being late with Daily Production Reports can cause your entire production to be shut down. With Dramatify’s new DPRs, it’s so fast you’ll never be late again! 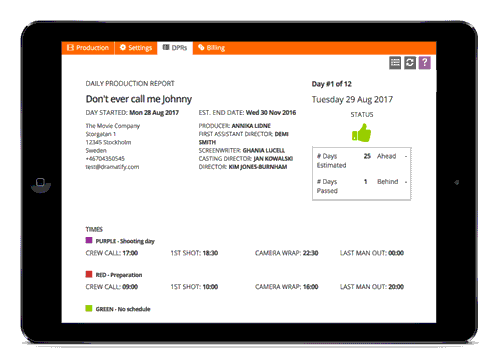 Dramatify’s Daily Production Reports automatically gathers all the relevant information you and your team have added for the specific day, from scenes shot, location and talent releases to plate count and working hours, while at the same time leaving some information open to be manually added such as payments and health & safely incidents. The Daily Production Report includes everything a DPR should. You easily adapt it to your production and production size. Several of Dramatify’s innovative features have been built to specifically support an almost automagic Daily Production Report. Naturally, you can delegate these tasks to other members of your production. To learn about Dramatify’s Daily Production Reports in detail, please read the tutorial. To make the DPR as smart as possible, we’ve even added a smart signing process where you can add exactly who should sign an individual DPR. Signers get a message in Dramatify (automatically forwarded to their email inbox) that they have a Daily Production Report to sign. They either sign it, or reject it with a comment, to be corrected and re-submitted. Below you find an example of our DPR template. Note that in the digital version, files and attachments are accessible (clickable). It can also be printed on paper or as a pdf and sent to co-producers, investors, insurance and bond companies. Top image by Bro. Jeffrey Pioquinto, SJ/Flickr (CC BY 2.0).